Splayed Cabinet near the Breakfast Nook eases the entrance. Soffits follow the Cabinetry. An Arched Panel to close off the top part of the Sink Window ties in the design across the top of the Doors.. 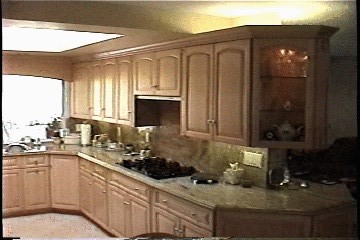 Lighting Under the Uppers to light the Counters, Lighting Interior, and Lighting Above where exposed. 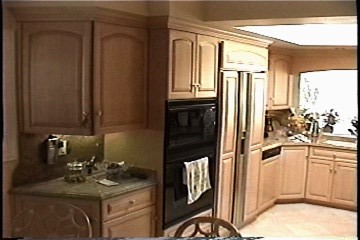 The Hood is retractable leaving a clean line down the Upper Cabinetry run. Clipped Corner Cabinets beside the Sink house Full-round Lazy Susans. 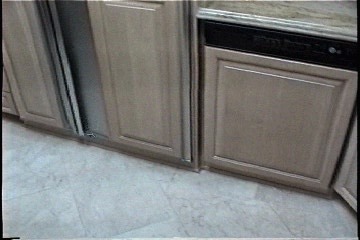 Kick Plates set in front of the Appliances.. 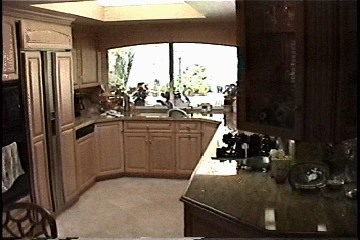 The Kitchen Counters wrap around into the Family Room. This really ties these Rooms together. 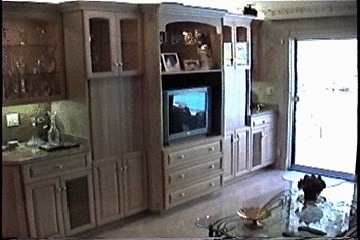 The Entertainment Section with Verticle Tambor Doors and Speakers set behind Cloth inset into the Doors.